Low down payment and partial OWNER FINANCING. This Live Oak plan is amazing and affordable! 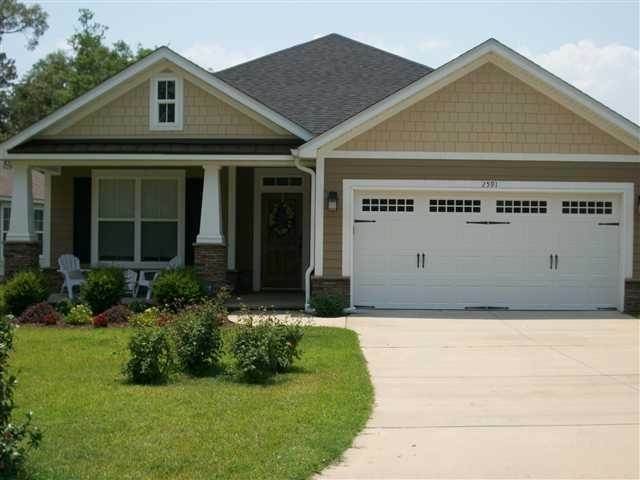 Granite countertops in kitchen, corian in baths, Beautiful #1 red oak floors, stainless appliances, custom cabinets, 2 step crown moulding in living area, 7" base moulding, picture framed windows, fenced yard, sunroom with screened porch. NEW exterior, interior paint and new carpet!! Hurry...won't last long!! Built by award winning builder. Top Rated Schools. For more information call Broker/Owner, or view website for more homes in builders 6 communities or take brochure from outside box. Available Now. Supra Lock Box. Seller pays 100% of normal closing cost with preferred lender. Listing agent is affiliated with the seller. SchoolsClick map icons below to view information for schools near 2591 Manassas Way Tallahassee, FL 32312. Listing provided courtesy of Tallahassee Homes Realty LLC.